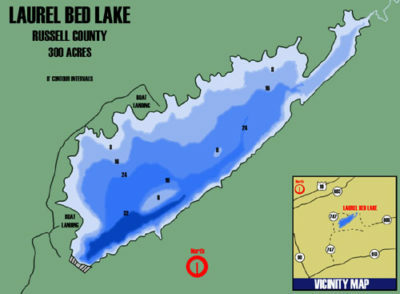 Laurel Bed is a Department-owned lake located in Russell County on the Clinch Mountain Wildlife Management Area. This 330-acre lake rests on the top of Clinch Mountain at 3600 feet of elevation. It is surrounded by second growth hemlock and mixed hardwoods, and provides a spectacular setting with scenery rivaling that found at an Adirondack or Canadian natural lake. Liming projects have improved the lake’s pH to suitable levels, and have allowed the restoration of a brook trout fishery. Although considerable effort was expended to remove rock bass from the lake in 1996, rock bass have returned to the lake. Smallmouth bass fingerlings have been stocked to control rock bass abundance. If smallmouth can keep the rockbass population at a manageable level, both populations could enhance and diversify fishing opportunities in the future. Laurel Bed Lake is closed to fishing for the five days prior to the first Saturday in April. The access road leading to the lake is often gated during the winter months due to hazardous conditions; so call the VDGIF, Marion Regional Office at (276) 783-4860, or the Clinch Mountain Wildlife Management Area Office at (276) 944-3434 prior to making a trip during the winter. From I-81 take Rt. 107 from Chilhowie to Saltville. Turn left on Rt. 91, then right at traffic light on to Rt. 634. Go to Allison Gap, take a left on Rt. 613, then a right on to Rt. 747. Turn right in to the Clinch Mountain Wildlife Management Area. Since the initial introduction of smallmouth bass in 1998, Laurel Bed Lake offers anglers an opportunity to pursue trophy smallmouth bass in a large high-altitude lake that is similar to what many would expect to find farther north. Smallmouth bass in excess of 20 inches are regularly caught by anglers using a variety of methods including plugs, spinners, and live bait. Smallmouth bass are managed as a catch and release fishery at this location. Rock bass and bluegill are the primary sunfish species found in Laurel Bed Lake. Average size of rock bass has improved dramatically over the last few years as the bluegill population has developed. Anglers can expect good fishing for either species. Fingerling brook trout and rainbow trout are stocked annually into Laurel Bed Lake as part of a put-grow-take fishery. The best brook trout fishing occurs during April, May, and June. Rainbow trout fishing can remain quite good through the summer and fall. Trout can be found throughout the lake during most of the year; however, anglers should concentrate on the springs and small tributaries during July and August which concentrates trout looking for cooler water during the dog days of summer. Anglers have reported catching brook trout up to 15 inches and rainbow trout up to 18 inches in recent years. Effective, April 2016 fishing is allowed 24 hours a day. All smallmouth bass must be released unharmed. Because only fingerling trout are stocked, anglers DO NOT need a trout-fishing license. Gasoline motor use is limited to 9.9 HP or less. There is a concrete boat ramp at the lower end of the lake and a graveled launching area about midways on the lake. Good bank fishing opportunities exist near the dam and along the north side of the lake. A portable pit toilet is available at the boat launch on the lower end of the lake from April through October. Laurel Bed Lake is limed on a two-year rotation. About 150 tons of limestone dust is distributed into the lake to increase pH and acid neutralizing capacity. This treatment is necessary to support the fish species in the lake as the watershed of Laurel Bed Lake has very little natural buffering capacity. Without treatment, the lake’s pH drops below 5.0. By adding limestone dust every other year, the lake’s water quality can be maintained at levels that support fish and other aquatic life. For more information on the liming project, click the link below. For more information contact the Region III VDGIF office.